Jason Coluccio writes frankly about future directions in the legal profession, why law firms are facing huge challenges today and what he did about it. When I joined the legal profession in 2011 it was not as a fledgling, wide-eyed twenty-something graduate (with minimal life experience), but rather, as a reasonably savvy businessman with a proven track record in sales. It followed then, that the lens through which I viewed the legal profession was perhaps a little unique. It was this lens that had me immediately question what I viewed to be the rather antiquated practices in the legal profession as a whole. You see my first experience in law was in the corporate world. It was a world which I felt was struggling to maintain a hold on the traditional ideals of ‘what law was’ and ‘what lawyers do’ amidst a tidal wave of change driven by economic and technological factors. It seemed to me that lawyers, in general, were grappling to hold onto a sense of their own autonomy and work practices that were more akin to a pre-industrial age type cottage industry. Where was teamwork? Where was the drive to improve the efficacy of the work that lawyers do? Furthermore, I was deeply concerned by the apparent inability for lawyers, as a whole, to engage with clients (and potential clients) using emerging technologies (and in this I’m speaking of those beyond that of a website). While there was a handful of visionary lawyers (and firms around), the vast majority were stuck in the past, refusing to move forward and undoubtedly headed for a slow grinding halt. It was at this point that I came across the work of Richard Susskind, author of Tomorrow’s Lawyers: An Introduction to Your Future (2013). Susskind’s book echoed my observations exactly, while taking this a step further and suggesting real solutions for lawyers and law firms wanting to exist (and thrive) well into the millennium. By the time Greg Welden and I were ready to start our own firm in March 2014, we realised that any business we created must effectively ‘redefine’ what law is, along with ‘reimagining’ the processes for how lawyers work. The old model, which valued autonomy, was unproductive and ineffective. Instead, our strength as a firm would be discovered through collaborative processes and teamwork. We knew that we must become social media experts, constantly alert to new opportunities and methods to engage with our clients. Finally, and of great importance, we understood acutely that Law does not exist behind a partner’s desk in a room lined with leather bound books. Rather, that law, and everything that lawyers do is relational. Our work is one focused on people. 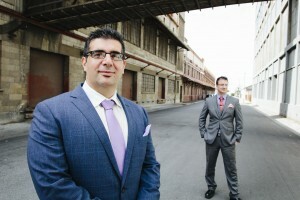 Welden & Coluccio Lawyers is a small, boutique law firm that brings a unique and fresh approach to the practice of law in all facets of estate planning, administration and litigation. We work collaboratively and transparently with clients to provide innovative solutions, a broad range of choices, thereby supplying a quality product that is enduring. We offer real experience and specialist knowledge that is service driven, communicated simply and is economically responsible. + We believe our primary role is to make Law look easy. + We believe People are at the core of our business and authentic relationships are central to everything we do. + We celebrate the challenge that emerges from what is difficult and complex. + We are passionate about learning and are committed to processes that drive us to evolve dynamically to meet the changing needs of our clients. + We believe in saying no to work outside our core practice area of law so that we can shine brightest in those areas we are deeply passionate about. Did it work? As the saying goes, “the proof is in the pudding”. Our business, while being a tremendous amount of hard work, has grown in strength above and beyond our initial expectations at a rate that is sometimes unfathomable. With two offices, four solicitors, and one supporting staff member, our greatest concern is not will we expand but how best to manage this growth in such a way as to honour our original ideals. Furthermore, the evidence of our success is not something measured only in profits. For us, it is about the real difference we make in the lives of our clients. Law is relational. It is about people and when we remember that it becomes all the more satisfying.